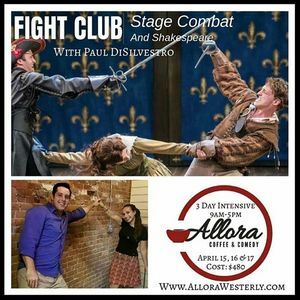 April 15th, 16th and 17th from 9am-5pm with a public showcase of your choreographed fight! Explore the martial & theatrical applications of sword fighting through the world of Shakespeare! Paul holds his B.A. In Theatre from Fordham University at Lincoln Center in their prestigious performance track program. He is also a recognized Advanced Actor Combatant with the American Society of Fight Directors. Some of his memorable teaching experiences include directing The Three Musketeers at the Oxford Theatre in Versailles, KY, as well as choreographing fights for Dangerous Liaisons in New York. Having had professional experience in both New York and Los Angeles, Paul brings a unique skill set that combines professional experience at the highest level with a focus on how acting can improve one's body awareness along with confidence in public speaking. For this series, Paul will work individually with the skill in the room and pair off with similar skill sets since there will only be 8 people. So from beginner to advanced are welcome. We would prefer ages be at least 15 years or older just because of the swords. These dates fall within local highschool April break so if you're thinking about signing up, don't delay. There are a lot of wonderful auditions coming up in May/June in CT/RI for Shakespeare in the Parks around the state so I wanted to make sure my program would compliment those! Thank you! !